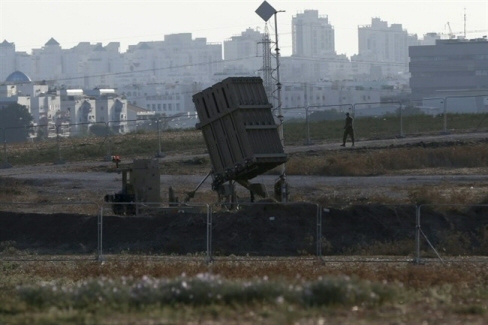 Israeli authorities claimed that the US-funded ‘Iron Dome’ defense system intercepted a shell fired from the Gaza Strip on Saturday night.An Israeli army spokeswoman said that sirens sounded across southern Israel, before a single homemade shell was intercepted south of Ashkelon. Since October 1st, 21 Palestinians have been killed, and 1100 injured. During that same time period, two Israelis were killed and two injured in a ‘lone wolf attack’ by a Palestinian man in Jerusalem. Hamas has not claimed responsibility for any homemade shells since last year’s devastating war, and the movement has been attempting to clamp down on many of the smaller armed groups. Earlier Saturday, however, Hamas spokesman Sami Abu Zuhri warned Israel that because of the recent string of Israeli war crimes against the Palestinian people, the Palestinians will defend themselves — despite their rther complete lack of weaponry or armed forces.